Campbell went on to become a regular on acclaimed USA TV show Burn Notice and doing voice work for the likes of animated movie Cloudy With a Chance of Meatballs. 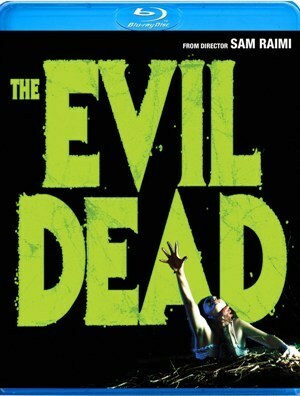 When The Evil Dead debuted as a limited edition Blu-ray (Anchor Bay, released Aug. 31, 2010), Disc Dish wangled an interview with Mr. Campbell about the film and its place in his life. Disc Dish: The Evil Dead continues to live in a unending stream of popular re-issues and new editions on DVD and now Blu-ray. Did you think it would be such an immortal movie? What is it about the film that keeps it rolling on, gathering new fans and perpetually selling in all its permutations? 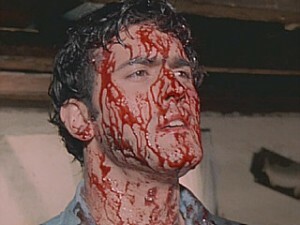 Bruce Campbell: I think the film just has a little more going for it than the average horror flick. The supernatural aspects make it more than just a stalk and slash flick, and we all put an enormous amount of youthful energy into making it. More than anything, I think it’s actually a creepy, scary movie. DD: What are your opinions/criticisms about your own performance in the film? Amd what would you change or focus on more — if anything — on what you did on screen? BC: I wouldn’t change anything, because it’s a great time capsule of where I was, professionally, at 21. I’m happy with my stuff in the second half of the film, where we were really getting into it. The first half is too stiff and lame. But what are ya gonna do? Can’t take it back. DD: Rarely has an actor with such a lengthy resume been so dedicated to an early work. You always seem happy to talk about it whenever the opportunity arises. What do you enjoy talking about most in regards to The Evil Dead? And can you give me a favorite story about your dealings with diehard fans of the film? BC: The fan stories are too many to relate, although Austin holds the record for the most Evil Dead tattoos I signed (next to or below the tattoo) where the fan ran back out to the parlor to tattoo the signature. I will say this: I remain loyal to that film and the series because it established me in the industry and gave me a way in. For that, and the following of the fans (I still have a kid in college after all), I’ll always be grateful.